Smooth surfaces may prevent harmful deposits from working their way into a solid electrolyte. Looking forward, energy efficiency employers project the highest growth rate over the next 12 months (about 9 percent) while the [fossil] fuels sector reported it expects a decline in employment of about 3 percent over the same time period. PV systems must not only be tested to proper standards and methodologies, but the design data must also be applied consistently and accurately to prevent failures costly to customers and harmful to the PV industry. How Was Renewable Production Able to Surpass Nuclear Power? In March, renewables provided 21.6 percent of the nation's net electricity generation compared to nuclear's 20.34 percent. In April, that lead jumped to 22.98 percent compared to 19.19 percent from nuclear. Hawaii's PUC allowed the utilities to end their popular net metering programs and replace them with the Customer Self Supply program. The CSS program requires zero exportation of self-generated power back to the grid, which can most-efficiently be accomplished by integrating battery storage into the system. To address the rapid changes in the energy market, Siemens is partnering with leading accelerator Plug and Play to identify and work with startups that have the potential to disrupt the energy industry. Total order quantity reaches all-time high. - KACO new energy GmbH sells 1.4 gigawatts of inverter power in the first half-year. Designed and manufactured in the U.S., the AllEarth Solar Tracker is a complete grid-tied, dual-axis solar electric system that produces up to 45% more electricity than fixed systems. The tracker uses GPS and wireless technology to follow the sun throughout the day for optimal energy production. It has an industry-leading 10 year warranty and 120 mph wind rating, superior snow shedding, and automatic high wind protection. Its simple, durable design and complete system pallet simplifies costly procurement and installation time. Contact us about becoming a dealer partner or purchasing an AllEarth Solar Tracker. 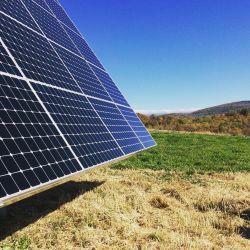 Solar FlexRack, a division of Northern States Metals, is an integrated solar company that offers custom-designed, fixed tilt ground mount and single-axis tracking systems in the commercial and utility scale, solar mounting industry. Solar FlexRack also offers full turnkey packages, including engineering, geotechnical, pullout testing, field, layout, and installation services to address the actual site conditions of an installation, providing a full scope of services from design to delivery and installation.